On Sale Now! Free Shipping Included! Save 3% on the Wall Control 30-P-3232GV Galvanized Steel Pegboard Pack by Wall Control at Webco. MPN: 30-P-3232GV. Hurry! Limited time offer. Offer valid only while supplies last. The Wall Control Metal Tool Pegboard - Pack of 2 helps take your garage, tool shed, or kitchen from cramped and cluttered to ordered and organized. The Wall Control Metal Tool Pegboard - Pack of 2 helps take your garage, tool shed, or kitchen from cramped and cluttered to ordered and organized. This pair of pegboard panels accepts standard or slotted pegs, hooks, brackets, or shelves, letting you customize your work area as bet your see fit. The panels are made from heavy duty, 20-gauge steel and require no frame to mount them to the wall (necessary mounting hardware is included). A variety of color options are available. Panels weigh 13.5 lbs. For over a decade, Wall Control have provided home handymen and do-it-yourselfers with simple, easy-to-install wall storage available in a variety of colors and styles to suit any room in your home. Domestically based in Tucker, Georgia, Wall Control ensures quality American craftsmanship that's guaranteed to last a lifetime and looks great while doing so. Its patented designs are here to make your life easier, made from sturdy materials that let you customize any room in your home the way you see fit. 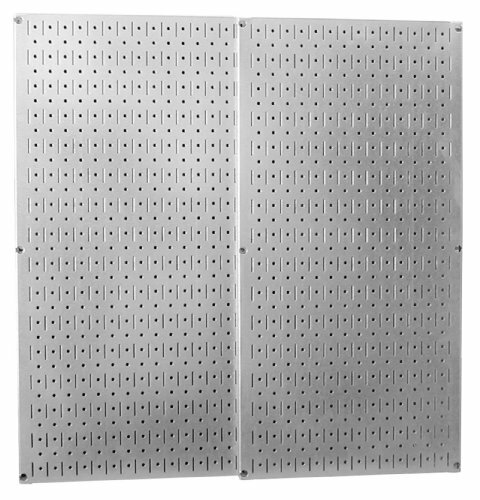 Large storage pegboard for home or garage. Dimensions: 32W x .75D x 32H inches. Simple installation, no frame required. Mounting hardware is included. Made of solid 20-gauge steel. Available in a variety of color options. If you have any questions about this product by Wall Control, contact us by completing and submitting the form below. If you are looking for a specif part number, please include it with your message.